Trusted Reviews has tested a all-in-one printer from Epson. The printer is called Epson Stylus Office BX320FW and is able to print up to 38 pages per minute or so Epson claims. Trusted Reviews ends up giving the Epson Stylus Office BX320FW an overall score of 7 out of 10 points. The printer scores highest on print speeds and a bit lower on features, print quality and value for your money. The BX320FW is a good printer, but there are better printer out on the marked that give you more for your money like the Epson Stylus SX610FW printer. 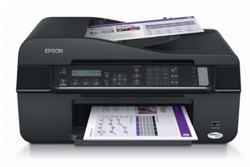 Read the full review of the Epson Stylus Office BX320FW printer here.